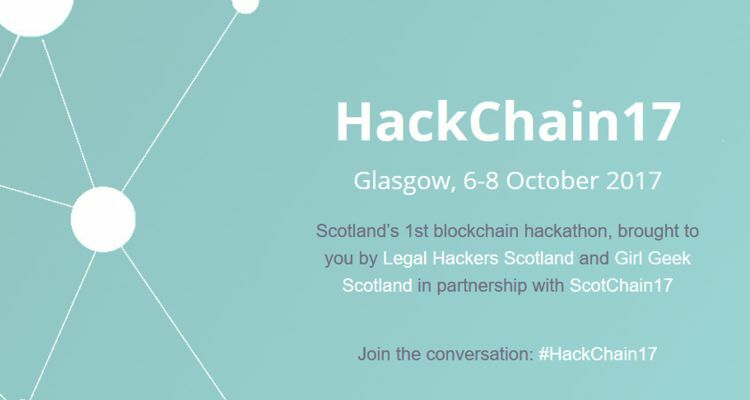 HackChain17 – Scotland’s 1st Blockchain Hackathon – Glasgow, 6-8 October 2017"
Brought to you by Girl Geek Scotland and Legal Hackers Scotland in partnership with ScotChain17. Blockchain is an area of rapid growth globally, with a number of start-ups in blockchain flourishing in Scotland. We’re thrilled to be hosting HackChain17, Scotland’s 1st blockchain hackathon, in partnership with Scotland’s leading blockchain conference, and we hope you will sign up and get involved. The hackathon winners will have the opportunity to present their solution on-stage at the high-profile ScotChain17 conference, attended widely by industry leaders, investors and technical experts. The event is open to all (must be 18+ years), and there will be some optional workshops running before the hackathon if you are interested in learning more about blockchain development. Details will be posted on the Girl Geek Scotland website soon. Smart contracts and other blockchain enabled digital documents highlight the potential for traditional legal services to be disrupted. Smart contracts can remove the need for enforcement of contracts in court, by having the agreement automatically execute on the blockchain and transfer funds in a verifiable way. There’s more to blockchain than cryptocurrency, and with the big players in financial services still firmly reliant upon legacy technology and software, there’s huge potential for innovators using blockchain to bring highly competitive offerings to the table. To realise the potential of personalised health-care and precision medicine, it’s essential to have reliable, consistent and secure personal health data. This needs to be stored for long-term use, out-lasting a patient’s relationship with any individual doctor, hospital or clinic, and should be portable world-wide. 1 in 6 people in the world has no form of official identification, according to the World Bank, which impacts their ability to access financial services, democratic processes, travel, education, health and government benefits. Blockchain could be used to facilitate uncloneable identity documents which could be validated worldwide. Only people who pre-register on Eventbrite will be admitted to the event. The event schedule is available on the HackChain17 website.